Former Scottish diver and Commonwealth Games Federation chairman Sir Peter Heatly has died, aged 91. 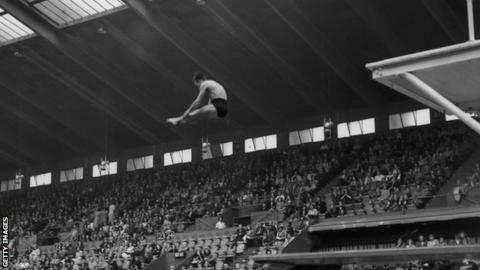 Heatly won gold and silver at the 1950 British Empire Games in Auckland. And he won further medals at the 1954 and 1958 events, then known as the British Empire and Commonwealth Games, and also captained Scotland in 1958. In total, he won three golds, a silver and a bronze in the 10m highboard and 3m springboard events at the Games, and chaired Commonwealth Games Scotland. During his chairmanship of the Commonwealth Games Federation, the Games returned to Edinburgh in 1986, with Heatly having been on the organising committee for the 1970 staging in the Scottish capital, where he attended school and university. At the Glasgow 2014 Commonwealth Games, Heatly's grandson James competed in diving for Scotland. Paying tribute on the Scottish Swimming website, the organisation's chair Maureen Campbell said: "Sir Peter has been an inspiration to so many people for many, many years. "The pride on his face as he watched James compete for Scotland was a joy to see and I am sure that his family, friends and the wider aquatics community, not just in Scotland, but across the Commonwealth will celebrate his life and the legacy he has left with the same enthusiasm that Sir Peter himself brought to the sport." Who's going to win Rugby World Cup? Read more on Rugby World Cup 2015: Who's going to win? Who will shine?